It's sometimes unclear where Google+ fits between Facebook and Twitter, but at last we know what it's good for: getting answers from executives at companies that have worked closely with Google. 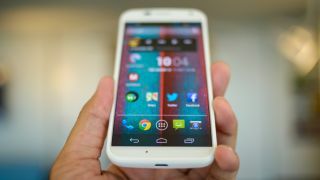 The Google social network is where Motorola Vice President of Product Management Punit Soni confirmed the Moto X is still scheduled to be upgraded to Android L.
After one user posed the question and another tagged Soni in the responses, the executive jumped in with a simple affirmative answer: "Yup." When another user complained of the speed at which updates go out, Soni replied, "Sad. We really try to speed things up…" A man of few words, it seems. Android L brings a bevy of improvements to Android, including interface adjustments and speed tweaks. Of course the Moto X only recently got the Android KitKat update on some carriers (cough, Verizon), so it may still be a while before Android L arrives on the Moto X. Meanwhile it seems likely that Motorola will launch its next flagship - what looks to be called the Moto X+1 - with Android L out of the box.